Those Who Teach, Stand the Most to Learn. “I know no more sacred duty than to rear and educate a child.” Ludwig van Beethoven. If you want to learn something, really learn it, try teaching it. Often, in my classes, I ask other students to explain a concept with which they themselves are struggling. Putting into words, repeating a difficult concept, almost as a mantra, to a receptive audience, another student, is the first step to assimilating it into your own consciousness. The best students, the ones who make the most progress quickly, have mastered the lost art of the teaching student. Ever notice that when we set out to learn only for our own self-improvement, to better ourselves, we often find it is a dead end struggle? There will always be distractions pulling on you that are more interesting. Why? The pleasure we hold only for ourselves is meaningless. It is a vacuum, into which nothing comes in or goes out. But if we learn so that we may apply and do, then we are motivated. Do what, you ask? My first answer is so that I may teach it. By sharing a new insight with others it becomes enlarged in my own consciousness. By teaching, sharing what I learn, not only am I helping others learn, I am helping myself in ways I could never foresee, alone with my knowledge. To learn as the yogi learns is to make my learning an offering to others. Then, by extension, what I learn, my art, also becomes an offering, deepened because the idea is lifted up as it is given to others. If my work is not an offering to others, I will soon become bored with it. Having a room full of art, with no intention of ever sharing it with others, is a vein pursuit. Without the desire to communicate to others, to move, touch and inspire them with my highest self, my activity, my work, will lack urgency and importance. My mission, therefore, is always to improve the lot of others through my work, to share the human experience with others, in whatever form the creative process moves me. Last month I wrote a play. This week I’m painting a portrait of my wife. All of it is a gift, given me, intended to be shared with others. And if people don’t care for the gift, which is the fear that stops most from trying, then I will redouble my efforts to hone my gift, throw it out and start again if necessary, and continue to reach out to others willing to receive it. If you like/don’t like or want to add to the ideas expressed in these blogs, I encourage you to comment. Also, you may want to get a copy of Point of Art – Second Edition, or download it today. I offer career coaching for those serious about a career in art. 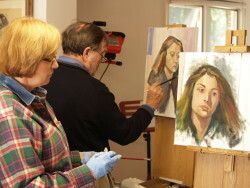 Don’t forget to check out The Portrait – a painting video and The Power of Positive Painting, the original portrait painting video.